I can’t believe my teen daughter is wearing the same kind of Hair Scrunchies (like these on Amazon) that I wore when I was her age. Wow! Hurry and get the Hair Scrunchies Velvet Colorful Elastic Hair Ties Pack for Women and Girls (multicolored, velvet) today for only $3.95 from Amazon! That’s just $.28 per scrunchie. Limit 2 packs! This product currently has all 5* reviews! Quickly see all your choices with prices here. Check out all of the recent Amazon deals here! 14 DIFFERENT COLOR scrunchies to match your outfit and every occasion. 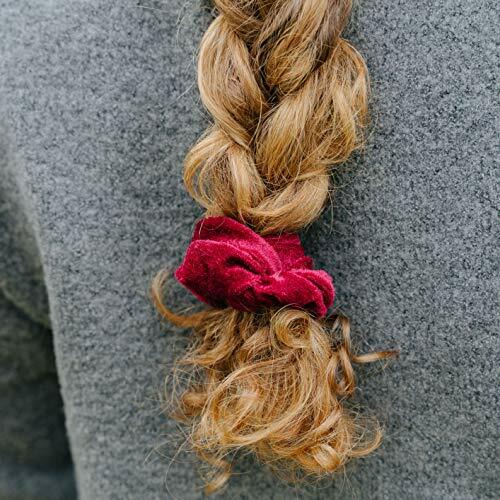 SOFT SCRUNCHIE has a durable rubber band inside. Will hold well and not damage your hair. SCRUNCHIES FIT MOST WOMEN, TEENS AND GIRLS HAIR – The unexpanded outer diameter is 11cm / 4.4 in, inner diameter is approximately 3.5cm / 1.4in, can be stretched. Handmade and size may vary a little. HAIR SCRUNCHIES are a great GIFT for yourself or your loved ones. LIFETIME WARRANTY – Love your hair scrunchies or we will buy them back from you, no questions asked. CLICK the Add to cart -button and order yours now. Buy the Hair Scrunchies Velvet Colorful Elastic Hair Ties Pack for Women and Girls (multicolored, velvet) from Amazon.